Winemaker’s Notes: Medium purple in color with aromas of cedar and cassis, with dark chocolate and black currants. Full-bodied, yet delicately balanced on the palate, with good structure and elegant tannins. Attractive finish. Pairs well with beef with sauteed onions or roasted lamb shanks. 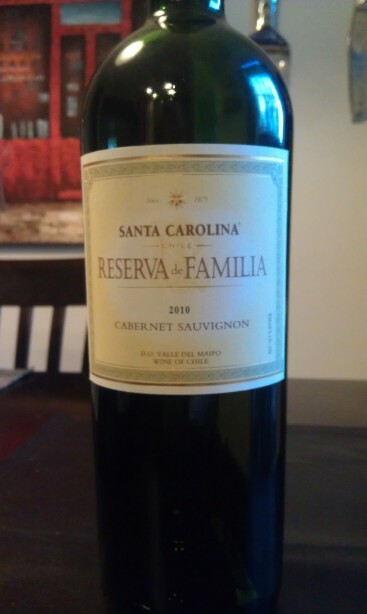 My Review: I don’t know how it was for everybody else, but Saturday in Richmond, VA was absolutely gorgeous, which meant the wife and I decided to grill some meat and sit on the deck for dinner, and since I was grilling a steak, some Chilean Cabernet sounded like a good idea. So, with steaks cooked and the wine decanted, we sat down for a meal and some drinks. Purple was easily the dominant color of the wine, and on the nose I picked up cedar and dark chocolate as the prominent notes, with some dark fruit that could have been the black currants. In the mouth the wine was smooth with good body. The tannins were present, but didn’t overwhelm the wine, and made it a great pairing for the steaks we had cooked. The flavors matched the aromas, though the currants and cassis were, at least for me, more prominent in the mouth than on the nose. Thanks to the soft finish the wine was easy to drink even without a steak to compliment it, something that I like in my bigger red wines. What I liked about this one is that for the price I got a very good, quality red wine that I could pair with a variety of grilled meats as we move into the warmer season – it wasn’t too big for its britches, but it knew where it stood. If you’re looking for a full-bodied but reasonably priced red wine for the start of grilling, this is a good one to check out. My only real complaint with the wine is that the bottle was incredibly thick and heavy, and I would have preferred to see lighter packaging. If that’s my biggest complaint, I think they’re doing something right and that you should check them out.